Gaming gets intense. There's nothing worse than preparing yourself to score a vital goal, finishing off that end-of level boss or taking your friend down with a headshot only to be on the receiving end because your finger slipped off the trigger! 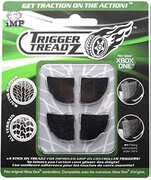 With iMP Trigger Treadz for PS4 Controller attach your controller triggers and give yourself improved grip. 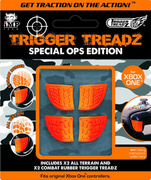 So when the going gets tough...get Trigger Treadz!